Most patients with critical cardiac or thoracic conditions will at some stage pass through the cardiothoracic critical care unit. Critical care presents more complex clinical data than any other area of medicine. Continuous monitoring makes diagnosis easy and further information can be easily obtained via a variety of diagnostic tools. 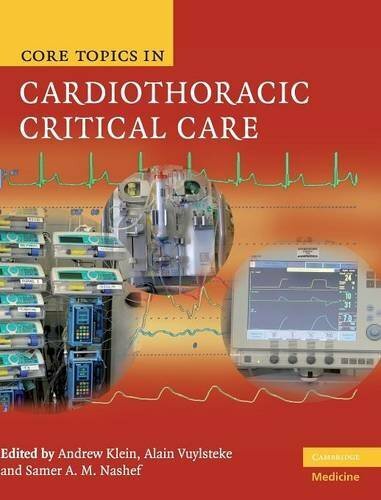 Core Topics in Cardiothoracic Critical Care will guide clinicians from all disciplines in the management of cardiothoracic patients, demystifying the critical care unit and providing the key knowledge in a concise and accessible manner. The central section is a detailed discussion of the management of each physiologic system; additional sections cover admission, general considerations in cardiothoracic critical care, procedure-specific care, discharge and follow-up, structure and organization of the unit, and ethical and legal issues. All aspects of the overall care of the critically ill cardiothoracic patient are explained concisely and comprehensively by experts in the field. Seriously ill heart and lung patients often spend time in a cardiothoracic critical care unit where care is invasive, using complex equipment and tests and producing reams of data. This concise, accessible text by experts in the field provides all the core knowledge required by any clinician managing these patients.